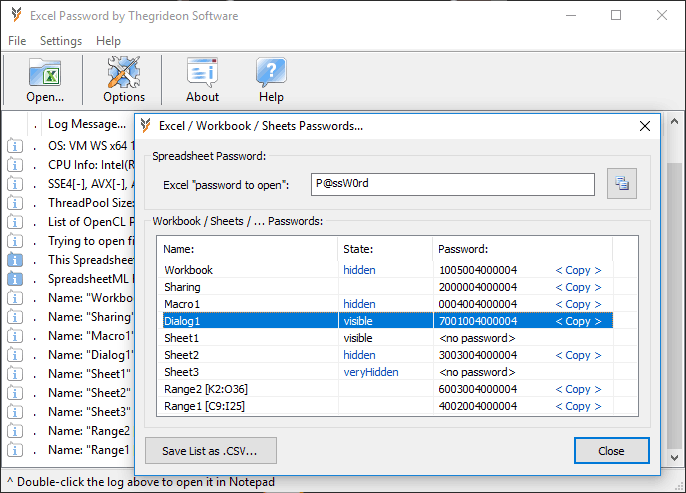 Excel password recovery tool by Thegrideon Software. 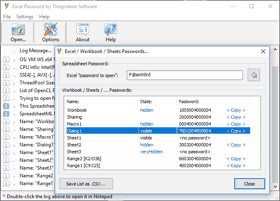 Excel Password by Thegrideon Software is a feature-rich and highly-optimized password recovery tool for MS Excel Spreadsheets and Templates (.xlsx, .xlsb, .xlsm, .xls, .xlt, ...). It works with new MS Excel 2007 - 2019 files (XML and BIFF12 binary formats) as well as with old MS Excel 95 - 2003 files (BIFF7 and BIFF8 formats). You may also check Password Search FAQ if "password to open" recovery is required. preset or custom char replacements: Ss with 5, Gb with 6, Aa with @, etc. 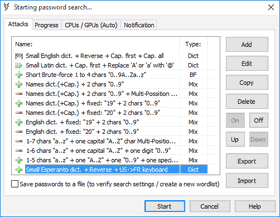 "Save passwords to a file" option to verify search settings or to generate a new wordlist, etc. Utilizes Intel HD Graphics GPUs as well. All MS Excel 95 - 2019 and Office 365 encryption methods are supported. Data in files locked with "password to open" is encrypted with password-based keys. Excel 97-2003 default encryption is not very strong (40-bit RC4) and data is extractable with guarantee (please check ExcelDecryptor for details). 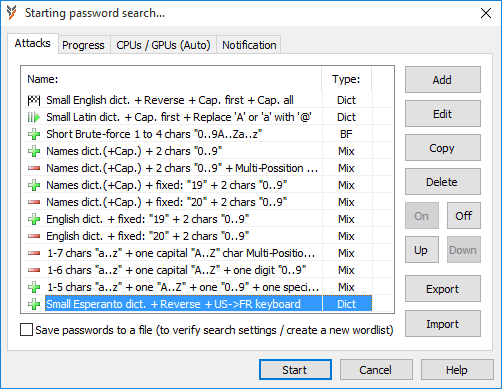 Excel 2007-2019 (and Office 365) formats are AES-encrypted with keys generated from passwords using PBKDF2 derivation function (with many thousands of SHA hash iterations to counteract exhaustive search), thus password is required to access encrypted data.Excel Password allows you to setup multiple password search attacks such as advanced mixed attacks to exploit any known password details (parts or patterns) and to cut search time required. It is highly optimized tool as you can see from test results listed below for some common CPUs and GPUs. Workbook, Sheets and Ranges passwords can be instantly recovered or removed by Excel Password. Passwords are not stored in a file and there are several format-specific methods to generate password verifications values (hash), thus in some cases passwords can be recovered or alternative passwords (with equal hash) can be generated and for some formats the best option is to remove protection altogether. Custom User Interface settings are occasionally used to hide some Excel features and options (e.g. remove standard Ribbon tabs with <ribbon startFromScratch="true"> customUI attribute). Excel Password allows you to view and modify Custom UI XML markup as well. VBA projects can be used to extend spreadsheets functionality (from basic calculations to advanced external data access), but in addition VBA code can contain "self-protection" routines. Manual code modifications are required to selectively disable some VBA protection functions (like sheets auto-lock on startup). You can disable VBA functionality in full (File tab -> Options -> Trust Center -> Trust Center Settings -> Macro Settings -> Disable all macros) or check VBA Recovery Toolkit to access locked modules, view source code, etc. For example (Excel 2007): Intel i3 + integrated HD 4400 GPU + AMD R9 270 = 2 100 + 820 + 27 300 = ~30 000 p/s (passwords per second). For cards with compute capability sm_35 (Kepler 2.0) and above (Maxwell, Pascal, Volta and Turing) you can expect approximately 2000-3000 p/s per every SM running at 1000Mhz for Excel 2007, 1000-1500 p/s for Excel 2010 and 150-200 p/s per SM for Excel 2013-2019. Test results below are shown to be very close to this estimation. AMD GPUs are very "password recovery friendly" and consistent with architecture change from VLIW5 to VLIW4 and now to GCN. You can expect approximately 1500 p/s per every CU running at 1000Mhz for Excel 2007, 750 p/s for Excel 2010 and 100-150 p/s per CU for Excel 2013-2019. It is important to mention that AMD and NVIDIA architectures are quite different and although AMD per CU performance is lower, there are more CUs per card in a similar price range. Moreover GPU performance is somewhat variable with number of factors including GPU/CPU combination and even a driver version. Please contact us if your recovery speed is noticeably different from the data above. Trial version can be used to check format and hardware compatibility. It allows you to setup and test run any password search for up to 15 minutes per set. Recovered passwords are hidden behind the asterisks.